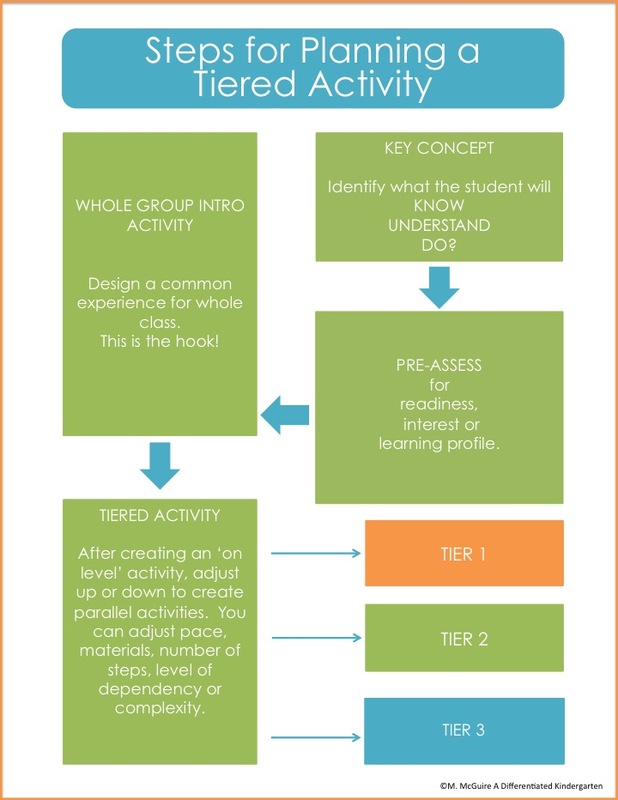 When we tier, we are address a student’s level of readiness. Readiness is meeting your students where they are. It’s recognizing what they know and what their abilities are NOW. Optimal learning takes place when a student is moderately challenged. It provides the means for reinforcement or enrichment depending on the student’s mastery of the concept. 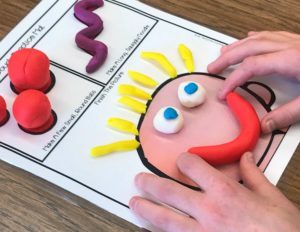 When a student is neither frustrated from too complex tasks nor bored from too simple tasks, they are more likely to be motivated and feel successful. Too much challenge and a learner will feel frustrated and shut down. Too little challenge and the learner becomes bored. Both situations usually end up in some kind of behavior problem. (I don’t know about you, but I do EVERYTHING in my power to avoid THAT.) Brain research tells us that optimal learning takes place when a child is moderately challenged and when the outcome is just beyond the learner’s ability. •Task should be based on an essential concept or skill. •Levels should be driven by ongoing assessment. •Utilize various materials and different levels of complexity as wells as learning profiles. •Regardless of level, tasks should all be meaningful and interesting. **I like to have these guidelines near me when I’m tiering just to assure I’m on the right track. 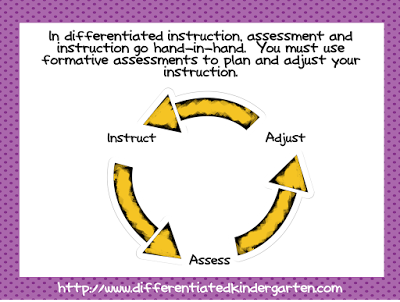 Remember one of the guidelines for tiering is that your instruction is driven by ongoing assessment. 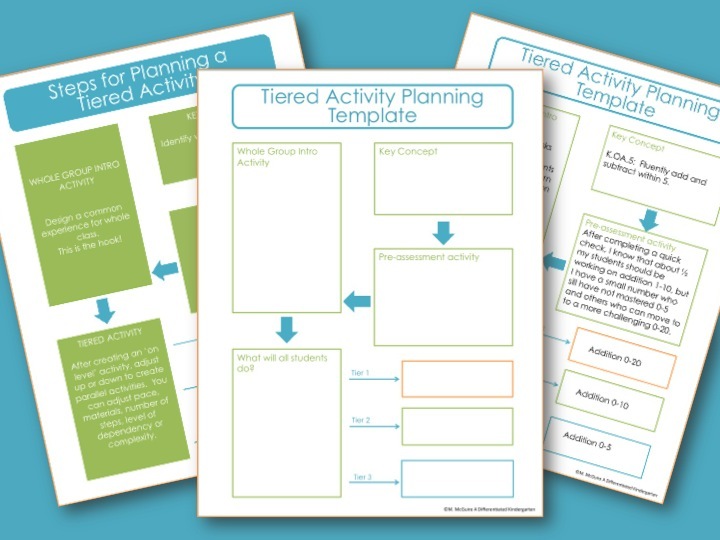 You HAVE to know where you students ARE before you can decide how to tier an activity to their ability. You can’t just guess. You really need to KNOW. That doesn’t mean you spend a lot of time doing formal paper-pencil assessments. I do very little. But through observations…simple games . . . thumbs up thumbs down . . .formative assessments…I always have a very good understanding of the skills my students still need to master and where they are. Below you’ll see the steps for tiering an activity along with a simple example. So how does this translate into your lesson plans and eventually your stations? That is the 100,000 dollar question. And I’m going to show you with the Community Helpers Stations. Now I want to preface this a bit because, if these are your first math stations to be used in the school year, of course, you are not going to tier them UNTIL you have had a chance to assess your students. Right? 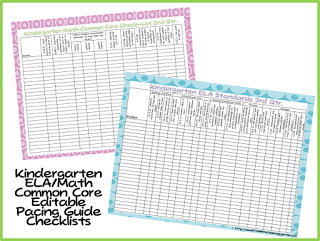 These my Back To School stations are used before these and are designed to help your students become accustomed to the routines and procedures of math stations. 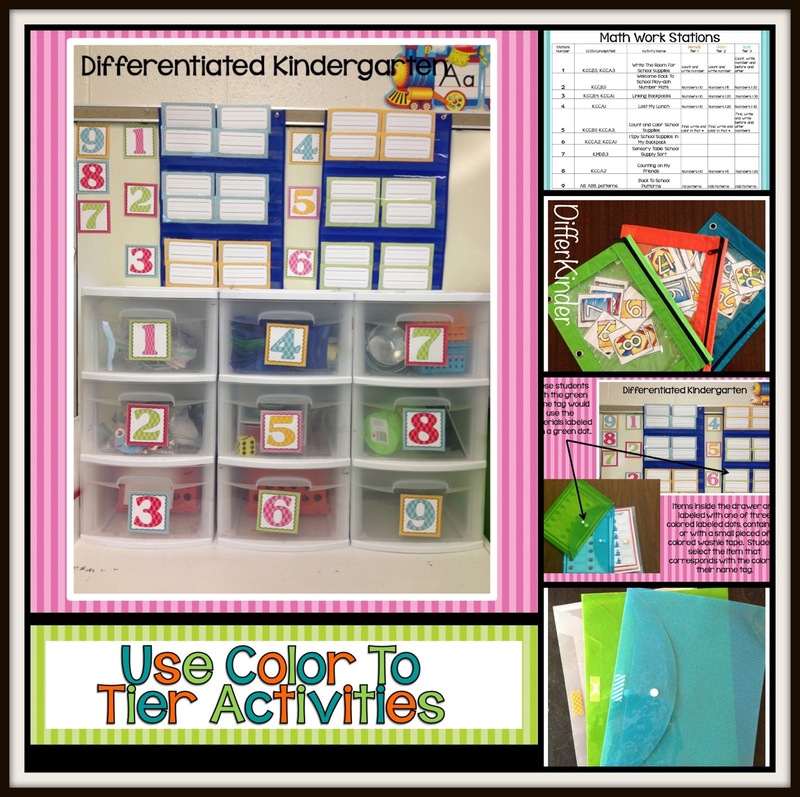 That being the said, there will be those students that latch onto those basic routines easily and will be ready for the challenge of learning about the ‘color’ routine of tiered activities by the second time you go through the stations. 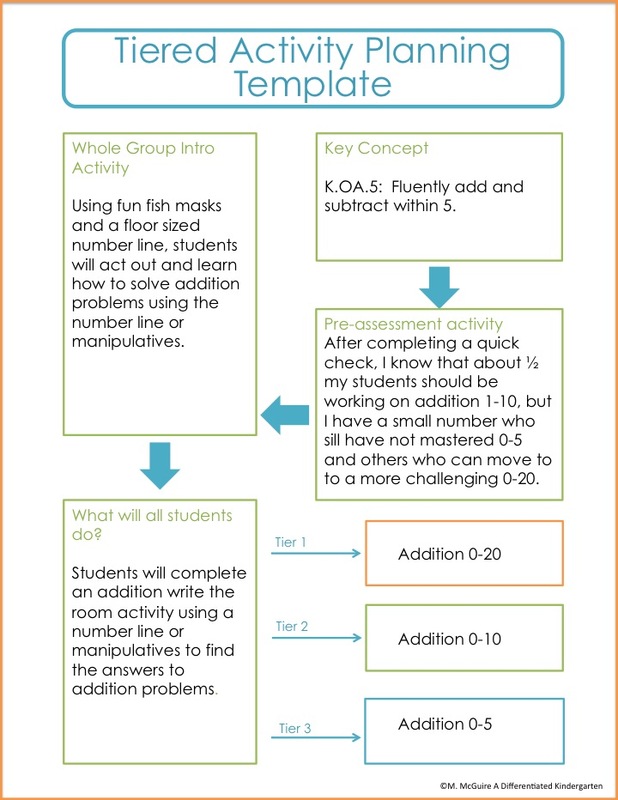 For those students, this is how your lesson plans might look as you tier your math stations. Now if you remember correctly, I have nine stations ready to go, but only 6 stations are being used at any given time. I have no more than four students at a station at a time. Each day that we do stations, we attend two. Each station lasts about 20 minutes. When the 20 minutes are up, we clean up and move to the next station. (Station numbers move down the pocket chart. 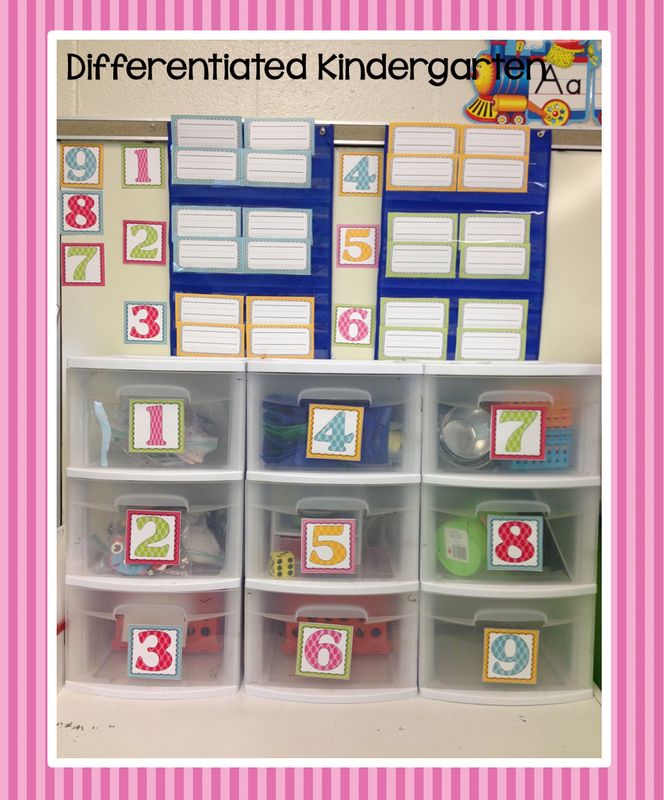 Inside each station drawer is an activity that may be tiered (or may not be because we don’t tier EVERYTHING…). Remember to start with only a couple of tiered activities to begin with so your students can slowly get accustomed to the routine. My tiered levels are color coded: orange, green and blue. I’ve been fortunate enough to never have a problem having a child that was color blind or who could not differentiate between the colors (which would be a huge issue), but if I did, I could always tier by patterns (stripes, dots or chevrons) or shapes or whatever was available. When a student goes to a station, they look in the drawer and, if the activity is tiered, there will be activities stored in a color coded container of some kind. 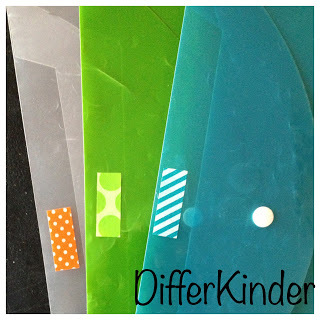 I use poly folders to hold tiered materials and place a small colored sticker or piece of washi tape to indicate the color. I also use colored pencil bags for smaller items. But really, you could just use a ziploc bag with a colored dot sticker and it would do the same trick. How does a student know which activity they should use? All they have to do is look for their name tag. If their name is on an orange tag, they use the activity stored in an orange coded container. If they are on a green tag, they use green and so on. Here’s another important thing to note. All my name tags are laminated so that if I need to quickly change a student’s tier I can do so by erasing their name for instance on a green tag and placing it on a blue instead. The other thing is that all the same colored tags need not be in the same group. I never set my groups up for math based only on ability. I can have two colors in the same group although I do like to make sure that everyone has at least on partner with the same color for any partner games. So for instance, if I had a group of students at the write the room station, even though they are all doing the same highly engaging activity(and desirable…kinders love to write the room), they are each doing it at their own level. Some may just be counting the items while others are counting the items AND then telling me the number that comes before and after. 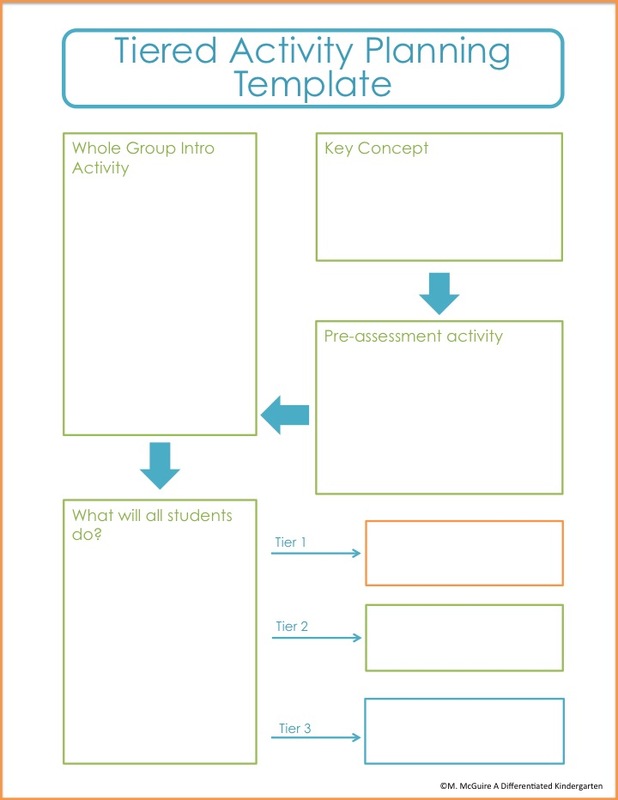 Were the tasks in my lesson plans based on an essential skill or concept? Yep. They were all aligned to a common core standard with the exception of patterning. Here’s where I am a bit of a rebel, because I think seeing and extending patterns are a precursor for so many other kinder skills that I will always have these kinds of activities at the beginning of the year. Are the levels (tiers) based on on-going assessment? They will be. I will use my Common Core Checklist data, observation notes and experiences to make sure all students are working at their readiness level. Have I addressed different learning profiles and use various materials? Hmmmm…I think I’m good here. What do you think? Regardless of the level, are the tasks meaningful and engaging? Yes. It wasn’t just a matter of giving more work to a set of students because their readiness level was higher than others or less work to those who were not as ready. Nor did only the students who were more advanced able to do the ‘fun’ stations or vice versa. Levels were designed to extend learning while allowing all students to complete the same engaging tasks. I hope this makes sense. It’s always the one question I get over and over so I want to give everyone a little insight as to how I make it work for me. Make sure you leave me your thoughts. 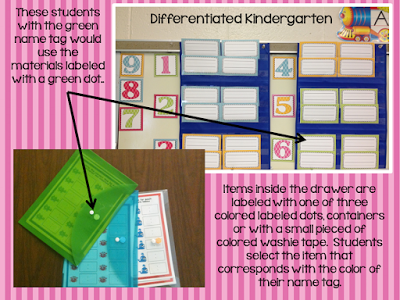 I’d love to hear other great ideas for organizing differentiated stations and centers. See, I wasn’t clear enough. I don’t get to these stations everyday because of our ‘specials’ schedule. Actually last year because of my schedule, I only was able to do math stations 3 times a week so my stations lasted three weeks. You can adjust the number of stations you use at a given time and the number of total stations available to fit your schedule. 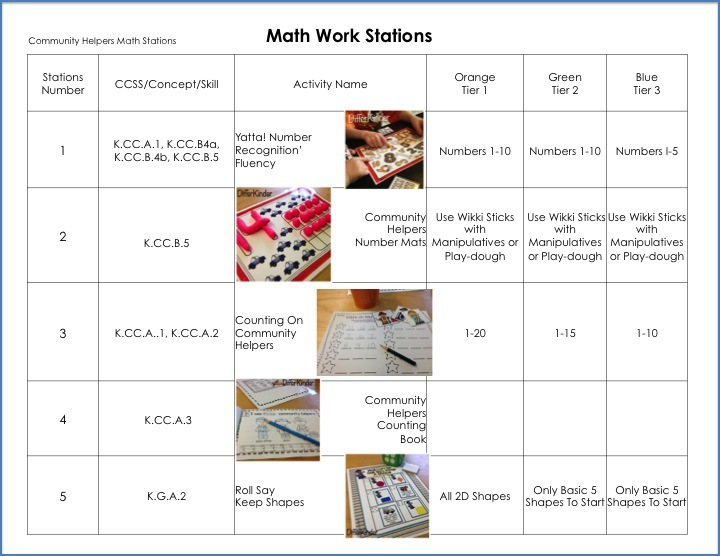 For instance, if you wanted your students to do math stations every day (my dream) and you wanted your math stations to change every two weeks then you would need a total of 10 stations. If you wanted to do your stations 4 times a week and wanted them to last three weeks, you would need 12 stations. That’s why I try to always have extra activities in my math stations galore packs. That way you can adjust it to what you need and how many stations you are hoping to have running at a given time. (I should also say that even though I don’t get to stations everyday, I still do calendar math books everyday with my kinders so they are still getting math instruction. This is just what works for me. If you start out small and keep adding more differentiated stations you can use any activities which you would normally use for your classroom. It takes a little work, but the results are well worth it. I am excited to use these back to school stations!!!! I’m going to try and start math stations in the second week of school!!!! Math stations are my favorite …hopefully with everyone working at their level, it will be your class’ too. Thanks so much for your comments. Thanks Mary. It helps me get back into the swing of things too. I’m moving to a new district! Thanks for sharing your plans in detail. Thanks so much. I have been trying to follow and “keep up”! I teach PreK and we are on a tight schedule. I was wondering if you thought the younger ones could use a version of this. We have 18 students. My plan is to incorporate this in our math rotations…4 groups (four or five to a group)…1 group with me, one with my assistant, and the other two groups using stations. I have the drawers similar to yours, but smaller and lots of them. (I think maybe 3 drawers would fit in one of yours. Are you familiar with that size?) I was thinking about using your system, but actually putting a color dot on each drawer. The child would just take small drawer to his/her seat. Clear as mud?  Well, you have definitely got me thinking!! Thanks so much!!! Getting you ‘thinking’ is a step in the right direction. I taught Pre-K and you can totally do it with them as well. It’s a matter of teaching those early routines, expectations and procedures. You might want to wait until those are REALLY solid before attempting it, but it will work. I’ve done it and you can too. P.S. Also I was wondering if you have ever posted or will post about your kindergarten daily schedule? Thanks for the awesome management tips!! This post totally had me rethinking things- and that’s a great thing! Wow, you are awesome! 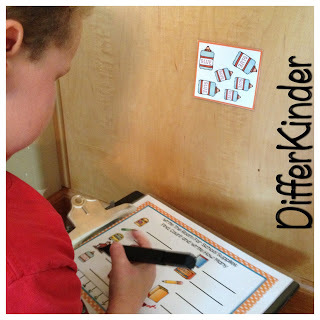 I never thought of differentiating math stations. I was just happy to get started last year. I bought enough tubs for 2 kids to partner up for each station. I’d love to get your Back to School pack. Thank you so much for sharing. I will be following you closely. Thanks again for this great explanation! I’ve gotten your station #s and so many materials and am ready and excited about giving stations a try. I was wondering a couple of things: What do the students do if they finish a station? Do you teach set station locations? (So station one materials always go to a specific table or spot on the floor to be completed?) What do students do with all of the papers they complete at the stations? Thank you, thank you, thank you! Hi Marsha! Thank you for walking us through this! I have learned so much from you! I am excited to. 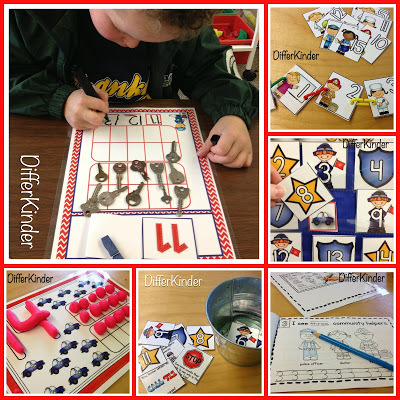 Get your back to school math stations. 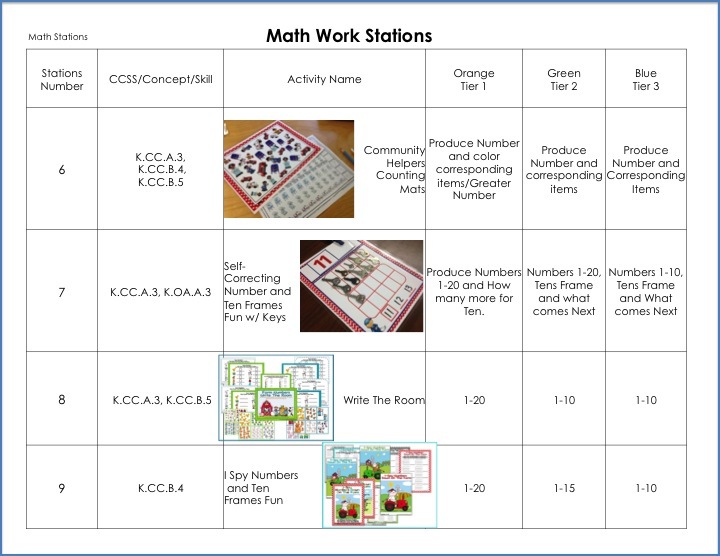 I see you have other math station galore packs, but they do not all have 12 activities. I would like to set mine up using all 12. Will you be publishing more packs of 12 throughout the year? I would definitely buy them! Thanks so much for your post! I was wondering if you could tell me where you found the plastic latching folders that you put your big stuff in, please? Thanks! Also, I was wondering about the 20 minutes at one station. What if the kids finish their work before the 20 minutes is up? Thank you! DI is my summer goal and you have made my goal possible. I am so excited to get started with my kinders! Thank you so much! 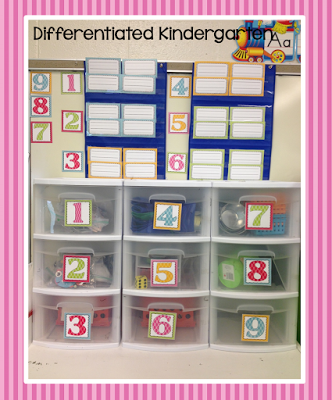 There’s a big push to differentiate stations, and I just didn’t know how to do it in a K classroom. Your ideas are a HUGE help! Thanks so much!!! So let me make sure I have this right? They do two stations/day? so if they do it 3x/week…how often do you change them out? Does that make sense? I love this explanation and look forward to incorporating work stations. 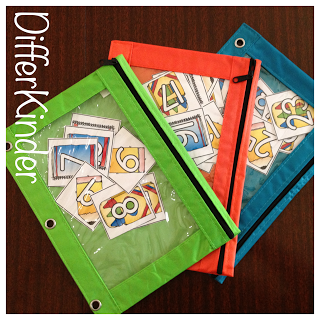 Do you have a packet that you utilize for language arts in the beginning of kindergarten? 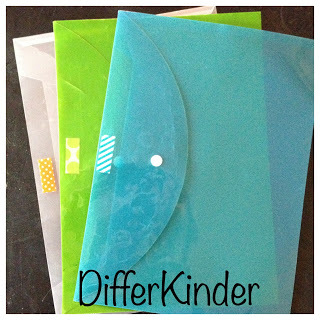 I love the idea of using pencil bags for storing smaller items. Where did you get them? 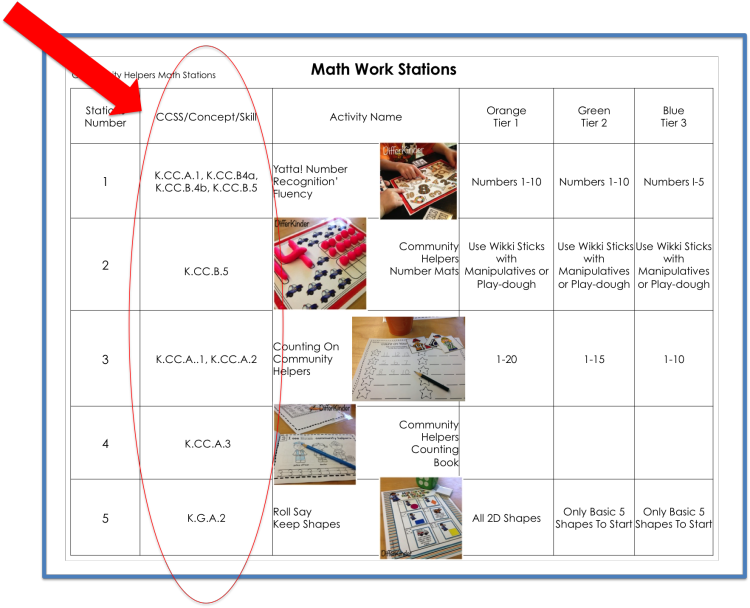 Is it possible to get a download to the Math Stations Lesson Plan that you have in this post that goes with your first packet? Thank you, Thank you, Thank you! I needed something like this to help with my classroom this year. I am so going to give it a try next week. Oh did I thank you?! Sometimes you can’t see the forest for the trees! I have been tiering Math and Reading for about 3-4 years. Color coded my reading automatically. Did I color code Math? Noooooooooooooooooo. Thank you. Hey Marsha, Thank you for taking the time to explain everything in such detail. I am starting math stations this year. Ive been in kinder for four years, and adjusted to literacy rotations last year, so now it’s time to tackle math. I was up until 2am last night planning! How do you feel about letting your students repeat a station? For instance, I am thinking I’ll have math stations 3xs a week. Using six stations, my students will be finished in two weeks. Do you think that there is any merit in having them go through them a second time for fluency? I was also thinking that this would allow any absent students a chance to get to each station at least once. I should say that my kiddos will go to just 1 station because they will rotate in three groups between myself, independent seatwork (using required curriculum) and stations. Thanks again! Yes, my students actually go to each station 2 times before I change them. It’s perfectly fine. They don’t get bored because these are the games and activities that they love.